Nobel Prize-winning author J.M. 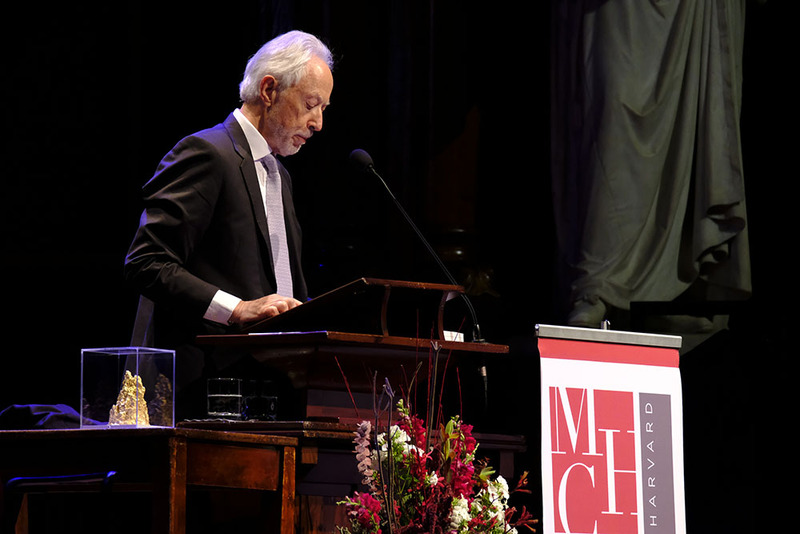 Coetzee received the inaugural Mahindra Award for Global Distinction in the Humanities in a Sanders Theatre ceremony Wednesday afternoon. Bookended by Bach solos by noted pianist Stephen Prutsman, the ceremony included an appearance by University President Lawrence S. Bacow and a discussion among 11 distinguished humanities scholars. The award, named after Anand G. Mahindra ’77 and his wife Anuradha Mahindra, was created this year to “celebrate the work and vision of an internationally renowned public figure whose career has contributed significantly to the flourishing of the arts and humanities,” Homi K. Bhabha, director of the Mahindra Center for the Humanities, said in his introductory remarks. The award will be presented every two years. Coetzee, 78, grew up in a white family in South Africa under apartheid. His first book, “Dusklands,” published in 1974, explores the psychological effects of conflict. He has won the prestigious Booker Prize twice — for "Life & Times of Michael K" and "Disgrace" — in addition to the 2003 Nobel Prize for Literature. Bhabha said the award itself, which was sculpted by Sir Anish M. Kapoor in the shape of a jagged mountain with many peaks and valleys, represents the lifelong journey undertaken by its recipients. “It is a long treacherous trek up until you reach the view from the top,” Bhabha said. In his acceptance speech, Coetzee noted the influence of reading the British “Children’s Encyclopædia” throughout his childhood, asking the audience, “What does it mean to have a mother tongue, and are there motherless people?” He said he has not yet come to terms with his own mother tongue, English. The subsequent roundtable discussion between humanities scholars and artists began with Bhabha posing Coetzee’s question to each of the participants. The panel featured English Professors Stephen J. Greenblatt and Elaine Scarry, African and African American Studies and English Professor Jamaica Kincaid, Music Department Chair Suzannah E. Clark, and History Professor Nancy F. Cott. The panelists discussed the virtues of and relationships between three of Coetzee’s favorite things: bicycles, Bach and Roget’s Thesaurus. Kincaid, who said she does not use a thesaurus, clashed with the other authors on the value of the tool, but admitted she had purchased eight in preparation for the event. “I really enjoyed…how they were able to weave together Bach, bicycles, and Roget’s Thesaurus in such a fluent manner,” Allston resident Andrew M. Burlile, who attended the lecture, said. Heather Baird, an Extension School student, said she has previously read several of Coetzee’s works.